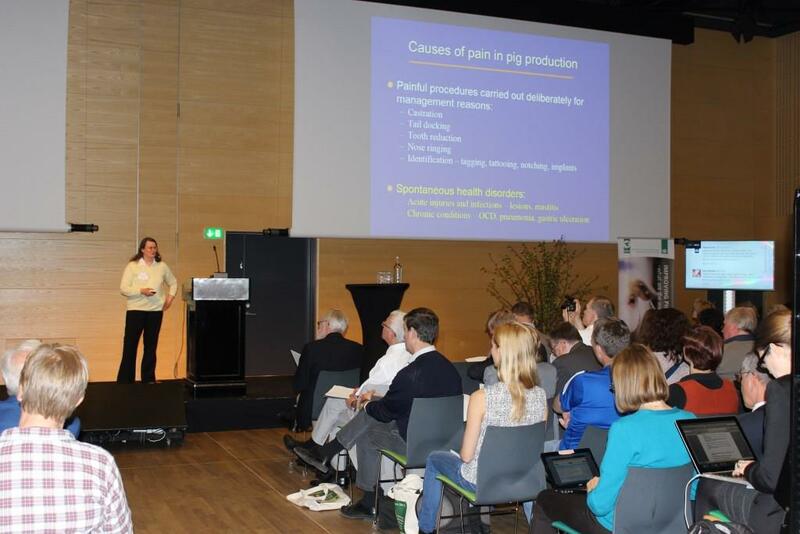 During the two-day conference, top academics, experts and political stakeholders from around the world debated and worked to prepare the way forward in improving pig welfare in Europe and ultimately in the world. Below you find ‘soundbites’ from conference presentations, all more or less related to the subjects of study in the FareWellDock project. An intact curly tail may well be the single most important animal-based welfare indicator in finishing pigs (EFSA update 2011, cited by P. Stevenson). Consumers can drive animal welfare improvements – Don’t keep them in the dark (P. Stevenson). The best common people are the agricultural population, so that it is possible to introduce democracy as well as other forms of constitution where the multitide lives by agriculture or by pasturing cattle. Aristotle, “Politics” (cited by D. Fraser). In the past half century, animal agriculture in the U.S. has been taken over by corporations, turning family farms into factory farms (Farm Sanctuary, 2009, cited by D. Fraser). Farm animal health levels: Piglet deaths: 0-50%; bursitis: 0-83%; sow mortality: 0-20%; dairy cow lameness 0-85%; broiler lameness: 0-90% (D. Fraser). Animal welfare reforms have been modeled on worker welfare legislation that regulated the physical environment and exposure time in factories (D. Fraser). Shifting animal production toward a professional model is a more promising approach to improving animal welfare and maintaining public trust in animal producers (D. Fraser). – It must be actively addressed. Genetic selection for increased littersize in Danish pig production has resulted in problems with piglet mortality that need to be solved, either by changing the breeding goal (to heavier piglets) and/or intensified piglet care (L.J. Pedersen). Increased piglet mortality is not an innate problem of farrowing pens where sows can freely more around (L.J. Pedersen). Piglets are born in a thermally insufficient environment (L.J. Pedersen). Organic pig production does well on naturalness, welfare perception and low antibiotics use, but needs to solve problems with piglet mortality, endoparasites and castration (J.T. Sørensen). Scientists cannot solve animal welfare. Politicians either. We need to collaborate to improve pig welfare (J.T. Sørensen). Lameness prevalense in organic sow herds is higher during summer (Knage-Rasmussen et al 2014, cited by J.T. Sørensen). The intelligent pig barn – PigIT – Welfare problems considered: diarrhea, fouling and tail biting (A.R. Kirstensen). From 2005 to 2050 the global demand for meat will raise: poultry from 82 to 181M tonnes, beef from 64 to 106M, and pork from 100M to 143M tonnes (43%) (J. Marchant-Forde). 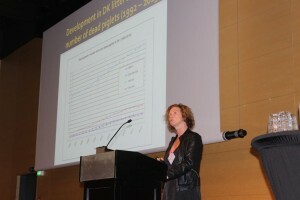 The Danish pig welfare conference showed an astonishing interest in pig welfare (B. Forkman). The social desirability effect implies that we tend to stay on the safe side, hiding what we really believe about something and simply reproducing stereotypes. So people have difficulty saying I don’t care about animal welfare (A.K. Krontalis). It will take a lot of effort to reveal the real opinions of people generally [regarding animal welfare] (A.K. Krontalis). 29.149 food products launched with the claim “ethical” on their description (top-10 categories, all European countries) (Mintel Gnpd, Apr. 2013 cited by A.K. Krontalis). Around 4,000 new food product launches with the term “Animal welfare” in their description. Mintel Gnpd, Apr. 2013 (cited by A.K. Krontalis). People with weak attitudes to pig production eat somewhat more pork (A.K. Krontalis). Not eating pork at all is not related to being critical to pork production (A.K. Krontalis). * Development of new (technology-driven) production (i.e. in-vitro or insect-based), with questionable social acceptance potential (A.K. Krontalis). Attitudes tend to direct our behaviour or, at least, our intended behaviour (P. Hemsworth). The best way to predict how stockpeople will interact with their animals is by knowing what their attitude is toward the activity itself (P. Hemsworth). To target ‘stockmanship’ both technical and behavioural training of stockpeople are necessary! (P. Hemsworth).